Once relegated to specialty health-foods stores, kombucha has made its way to grocery chains across America. The fermented beverage is rich in probiotics, or friendly bacteria, and contains far fewer calories than most soft drinks and juices. Kombucha is purported to boost immunity and aid digestion, according to National Public Radio, but the health benefits have not been well researched. At the least this is a diet-friendly alternative to other sweetened beverages. The black- or green-tea base of kombucha does not have significant calories, but the yeast and sugar do. The calorie count of your kombucha will depend on how much of those ingredients you use. Sugar has 16 calories per teaspoon, and yeast contains about 13 calories per teaspoon. Store-bought kombucha may have about 30 calories per cup. 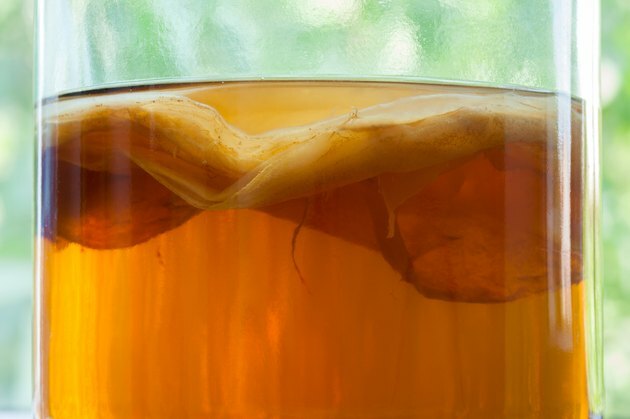 NPR: Kombucha - Magical Health Elixir or Just Funky Tea?